There's more to drumming than just drums. For starters, there are the cymbals. Cymbals provide the crisp snap, sizzle, crash, and metallic tone to augment the steady thump and pop of the drums. And while nearly all cymbals look alike, the tone, timbre, and function of each type of cymbal is unique. The materials, construction, and size all influence the finals sound. 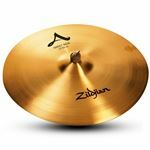 At American Musical Supply, you'll find a vast variety of models and manufacturers to choose from, so you can easily find the correct cymbal to meet your needs.